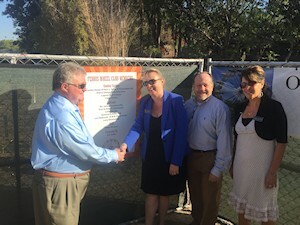 The Santa Ana Zoo is pleased to announce the next phase of its "master plan," which is supported and funded by the City of Santa Ana, as well as volunteers, donors and Friends of the Santa Ana Zoo (FOSAZ), is well underway. Under the guidance of its new Zoo Director Ethan Fisher, the family-friendly zoo is continuing to enhance and expand its 20-acre, stroller and wheelchair accessible urban forest. Among the new family-fun features for guests to enjoy are the Fifty-Monkey Ferris Wheel and the Dung Beetle Maze. A new series of education curriculum for local Scout Groups, as well as schools and community organizations, has also been developed. 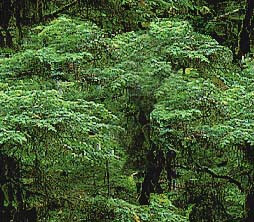 Additionally, new and remodeled habitats are in design for many of its existing residence including the endangered golden lion tamarins and the black-and-white Colobus monkeys. In preparation for its 15th Anniversary, the Crean Family Farm is scheduled for some additional TLC early next year. "With a ton of heart and a tremendous amount of support, focus and fundraising, we've set out to accomplish a lot with our 20-year master plan, and the positive response we continue to receive is incredibly motivating and rewarding," noted Fisher. "With the help of our staff, guests, FOSAZ members, musicians, sponsors and local breweries, we raised more than $20,000 dollars for our growing golden-lion tamarin family during our summer concert series. Our next big fundraiser is our black-tie gala - Zoofari - which takes place tomorrow, August 25th and will be emceed by KTLA 5's Henry DiCarlo. We are in a good groove and for all the right reasons, making it a great time to be involved and stay involved with the Santa Ana Zoo." "Ethan is an amazing Zoo Director, and his enthusiasm for the good of the animals and the experience of our guests is contagious and shared by his staff, our volunteers, FOSAZ and the City of Santa Ana," said Cathi Decker, director of FOSAZ. "We are thrilled to see the Santa Ana Zoo's master plan come to life and witness the smiles shared and the memories being made across all the generations who are enjoying the Zoo and sharing in our efforts to save and continuously protect the world's wild life and wild places." Fisher was appointed Zoo Director in January 2018, and has been part of the Santa Ana Zoo's team since 1998 when he first joined as a volunteer. The Santa Ana Zoo is home to more than 150 animals including more than 60 primates, giant anteaters, a rescued bald eagle, a binturong, more than 20 species of birds, as well as several near threatened and endangered species such as the golden lion tamarin, the ring-tailed lemur, the white-handed gibbon, the golden poison dart frog and the beautiful margay and incredibly agile ocelot cats. 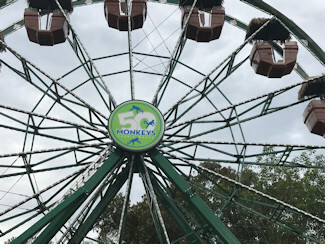 "FIFTY MONKEY FERRIS WHEEL" OPENS AT THE SANTA ANA ZOO on Saturday May 26! 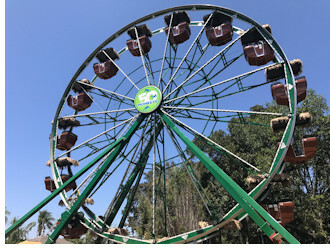 Cathi Decker, Executive Director of Friends of Santa Ana Zoo (FOSAZ), announced the Grand Opening of the "Fifty Monkey" Ferris Wheel at the Zoo for Saturday May 26. It is the first Zoo in the United States to put in a permanent thatched-roof style wheel. Nestled between the Zoofari Express Train and the Conservational Carrousel, the Fifty Monkey Ferris Wheel is the perfect addition for this local Zoo, providing a total of three child-friendly attractions to be shared and enjoyed by all ages. The ribbon cutting will be at 11 AM. The 64-foot Wheel soars at the entrance to the Crean Family Farm, placing a signature stamp onto this family favorite area. The Wheel is expected to welcome as many as 65,000 happy riders per year, which, together with the Train and Carrousel, will generate a projected game-changing gross income total of close to one million dollars annually. Executive Director Cathi Decker applied calculations based on the "synergy of three" (incremental ride increases based on a study of when three rides are aligned together) to compute these numbers. Net revenue will be used for Zoo improvements which enhance the Zoo for visitors and its animal residents alike. Uniquely designed to spotlight the Santa Ana Zoo's Fifty Monkey heritage, each fully-contained gondola features a unique endangered monkey, furthering the Zoo's dedication to the education of environmental conservation through the preservation of endangered species. Educational graphics telling the story of Joseph Prentice and the Zoo's requirement to house fifty monkeys at all times in order to maintain the land are found along the loading queue-line walkway. 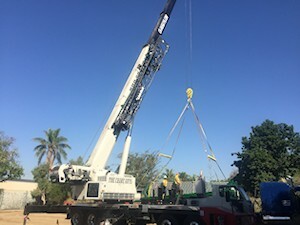 "Having been a part of Friends of Santa Ana Zoo for over seventeen years, the Fifty Monkey Ferris Wheel at the Santa Ana Zoo is one of the most exciting undertakings I have been part of," said FOSAZ Director of Operations, Kevin Jackson. "This attraction is sure to become a great community icon, serving families from all over Orange County and beyond for many years to come. I consider it a privilege to be part of the team bringing this beautiful Wheel to our community and am enjoying seeing the first riders' smiling faces as they go around!" Built by best-in-class manufacturer and Ferris wheel innovator, CHANCE Inc., the Fifty Monkey Ferris Wheel is engineered for long-term safety and success. "FOSAZ would like to thank Larry Breitenstein and CHANCE Inc. for designing and manufacturing a thatched-roof, century-style Wheel that blends in seamlessly with the Zoo's thematic elements. 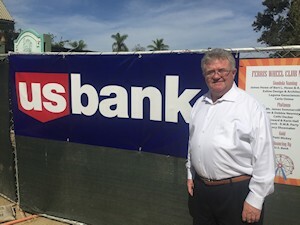 FOSAZ would also like to thank Gordon Nelson, Vice President and Joseph Gehley, Vice President of U.S. Bank for helping us to acquire the loan needed to fund the construction and the building of the Wheel to be paid off in seven years," added Executive Director Cathi Decker. The Fifty Monkey Ferris Wheel is open 7 days a week, 365 days per year (except on severe weather days) from 11 AM to 4 PM on the weekends; and 11 AM to 2 PM on the weekdays. Rides last approximately 10 minutes. During special events, the Wheel will stay open for longer hours. The Santa Ana Zoo is home to more than 260 animals, including 60 of the most interesting and engaging monkeys and several endangered species, like the golden lion tamarins. The Zoo is open daily from 10:00 am - 4:00 pm. The Santa Ana Zoo in Prentice Park is located at 1801 Chestnut Avenue, Santa Ana, CA 92701. October 6, 2016: FERRIS WHEEL ARRIVES ON THREE TRUCKS! 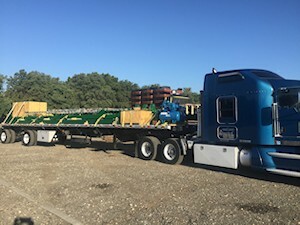 Pieces are unloaded at the future site. Construction continues with a grand opening this Winter! and Joseph Gehley, Vice President, U.S. Bank. 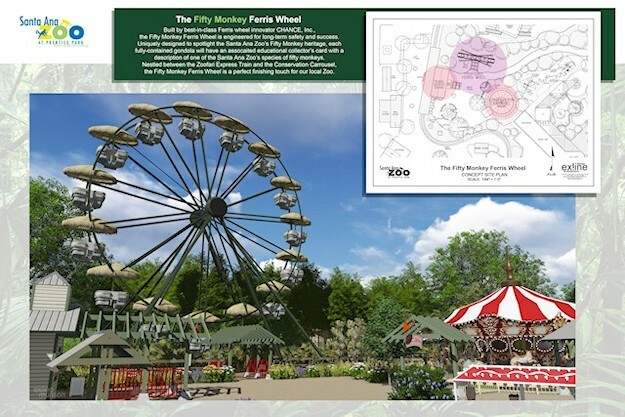 June 21, 2016: PLANS TO BUILD A FIFTY MONKEY FERRIS WHEEL AT THE SANTA ANA ZOO HAVE BEEN ANOUNCED! At 64 Feet, the Ferris Wheel Structure Will Showcase the Santa Ana Zoo; 15 Gondolas That Seat Up To Six Riders Each will Soar Up in the Air Carrying a Projected 65,000 Riders Every Year! Cathi Decker, Executive Director of Friends of Santa Ana Zoo (FOSAZ), revealed plans today for the Zoo to add a "Fifty Monkey" Ferris Wheel. The 64-foot Wheel will be installed near the entrance to the Crean Family Farm, placing a signature stamp onto this family favorite area. Nestled between the Zoofari Express Train and the Conservation Carrousel, the Fifty Monkey Ferris Wheel will become the perfect finishing touch for this local Zoo to present a total of three child-friendly attractions that can be shared and enjoyed by guests of all ages. 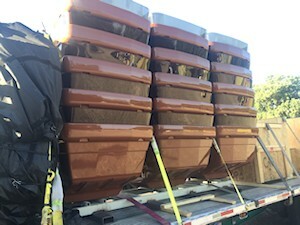 Uniquely designed to spotlight the Santa Ana Zoo's Fifty Monkey heritage, each fully-contained gondola will feature a description of a unique monkey species, furthering the Zoo's dedication to education and environmental conservation through the preservation of endangered species. Educational graphics telling the story of Joseph Prentice and the Fifty Monkeys will be found along the loading queue-line walkway. 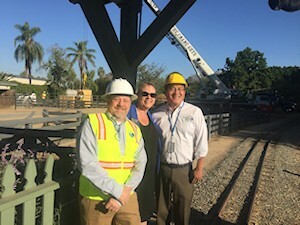 "The Fifty Monkey Ferris Wheel at the Santa Ana Zoo is certain to become one of the great landmark attractions," said FOSAZ Board President, David Exline. "There are very few opportunities in life to get involved with a project of this magnitude and uniqueness that can contribute to building a better community for generations to come. We believe that the Wheel will quickly become an iconic fixture, and we are proud and excited to bring it to the Santa Ana Zoo." Built by best-in-class manufacturer and Ferris wheel innovator, CHANCE Inc., the Fifty Monkey Ferris Wheel is engineered for long-term safety and success. "FOSAZ would like to thank Larry Breitenstein and CHANCE Inc. for designing and manufacturing a thatched-roof, century-style Wheel that will blend in seamlessly with the Zoo's thematic elements. FOSAZ would also like to thank Gordon Nelson and U.S. Bank on helping us to acquire the loan needed to fund the construction and the building of the Wheel to be paid off in seven years," said Executive Director, Cathi Decker. 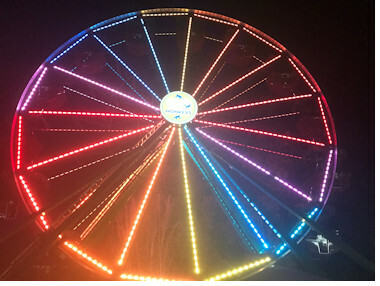 The Wheel is expected to welcome as many as 65,000 happy riders per year, which, together with the Train and Carrousel, will generate a projected game changing gross income total of close to a million dollars annually! Executive Director, Cathi Decker, applied calculations based on the "synergy of three" (incremental ride increases based on a study of when three rides are together) to compute these numbers. Net revenue will be used for Zoo improvements which enhance the Zoo for visitors and its animal residents alike. "As a partner in the advancement of the Santa Ana Zoo, I've seen first-hand what can be achieved when the City of Santa Ana and the non-profit sector work together," says Zoo Director, Kent Yamaguchi. "I want to thank everyone for helping to usher in this project that will produce added revenue to help the Zoo on an annual basis." 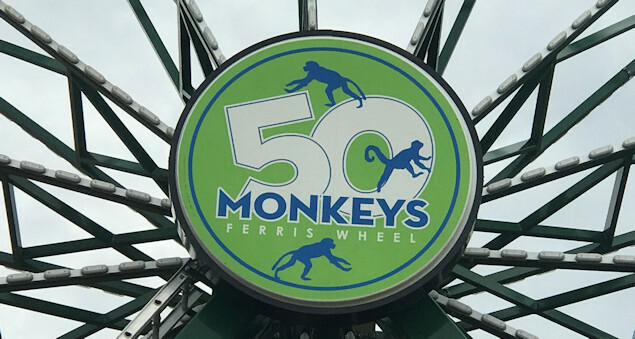 The Fifty Monkey Ferris Wheel is expected be open 7 days a week (except on severe weather days and required maintenance days) from roughly 11:00 am to 4:00 pm, on the weekends; and 11:00 am to 2:00 pm on the weekdays. Rides will last approximately 10 minutes. During special events, the Wheel will stay open for longer hours. Construction is expected to begin fall 2016, with the goal of a grand opening in winter. The Santa Ana Zoo is home to more than 260 animals, including 60 of the most interesting and engaging monkeys and several endangered species, like the golden lion tamarins. The Zoo is open daily from 10:00 am - 4:00 pm. The Conservation Carrousel Rides are $3 each and Zoofari Express Train Rides are $4 each, and combo tickets are $6 each. Children under 2 are free to ride with paid adult on the Train and adults standing with children on the Carrousel are free.